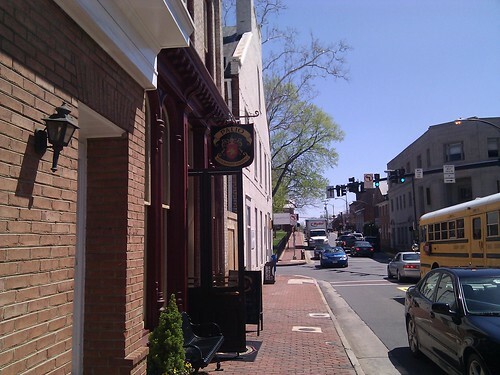 I had not been to historic Leesburg in a long time and a heads up about a tweet-up from Heather Elias (@LoCoHeather) brought me to this restaurant last week ( April 14th 2011). The restaurant opens into market street and you walk into the bar area which can seat about 25. The main restaurant is upstairs and can seat about 65. They have a private room for parties as well. I met the proprietor Antonio "Nino" Pino , a very warm and effable guy and has tonnes of experience in giving the Italian food experience including working with Chef Robert Donna who put Italian on the map of the DC region. 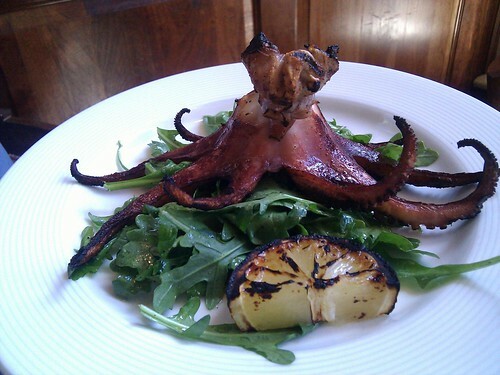 We had cheese and a appetizer meat platter and Gary Dickens of Leesburg Mag took Nino's suggestion to try the rare delicacy appetizer Grilled Octopus on baby arugula. Of course we all tasted it and this was a first for me and the taste was similar to calamari or other seafood. 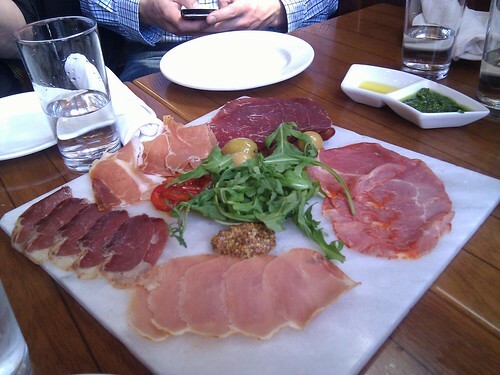 The meats and cheese platters were delicious and the Palio has a good wine list. Nino explained the meats to me and I made the mistake of not noting down what each meat was. They were tasty and even the appetizers and cheese could make up a good lunch. The downstairs has a Tapas style bar menu and the restaurant upstairs has an interesting lunch and dinner menu. See Rebekah Pizana review of Palio in the Loudoun Times and Davine Ker's review on Love Cake. Some very friendly and amazing Leesburg Twitterati who I met at the Tweet-up Stilson Greene, Victoria Stiles, Lisa Karl, Nils Schnibbe . I am definitely going to return to taste the regular lunch or dinner dishes soon. Have you been to Palio's ? What has been your experience? Parking : There is a huge parking garage on the opposite side where parking is free after 5 and on weekends and for the first hour. Other times it is only .50 cents an hour. Art of Appreciation That's Amore! Fabulous. Love it. I've been living in the Washington DC area for over 10 years, and this is the 1st Italian restaurant, that I've been to, that is a genuine Italian restaurant. I'm so glad they are in my town, though I would travel a distance to get there.